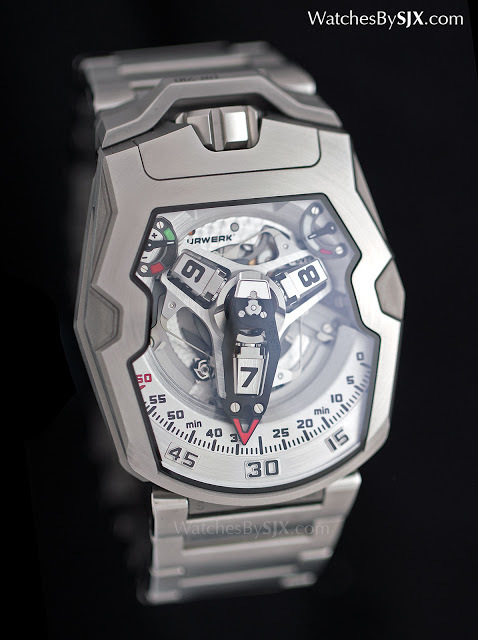 Urwerk’s top of the line satellite cube complication, the UR-210, has been upgraded with a matching bracelet, nicknamed the “Full Metal Jacket”. 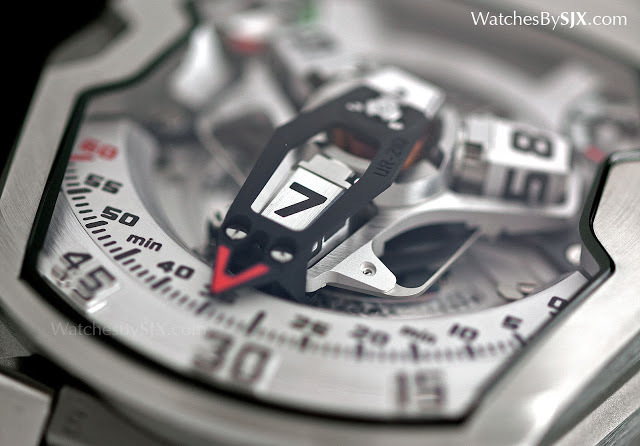 Launched three years ago, the UR-210 replaced the UR-202 and UR-203 as flagship complication by Urwerk. Now for the first time it’s offered with a hefty bracelet as the UR-210S Full Metal Jacket, an interrupted assembly of finely finished steel. The steel bracelet is made by Maspoli SA, a bracelet manufacturer located in Villeneuve, a town on the opposite end of the Lac Leman from Geneva. Made of steel, just like the UR-210S case, the bracelet is comprised of large, heavy one-piece links and a butterfly clasp. It is heavy, with a quality of finishing that is recognisably expensive. 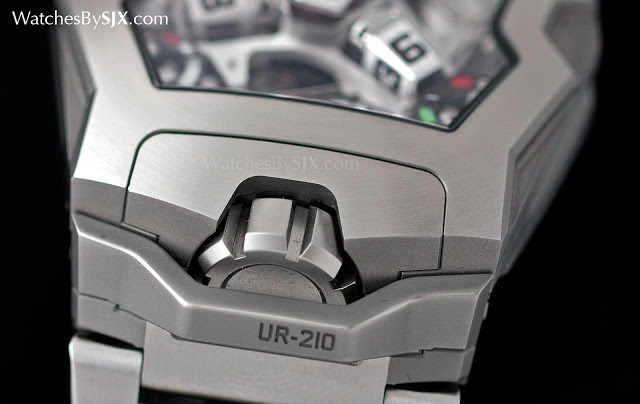 One key difference between this and the standard UR-210 is the crown guard that is part of the bracelet assembly. This sits over the crown and while it performs no functional duty, the crown guard enhances the aesthetic by echoing the form of the angular lines of the case. 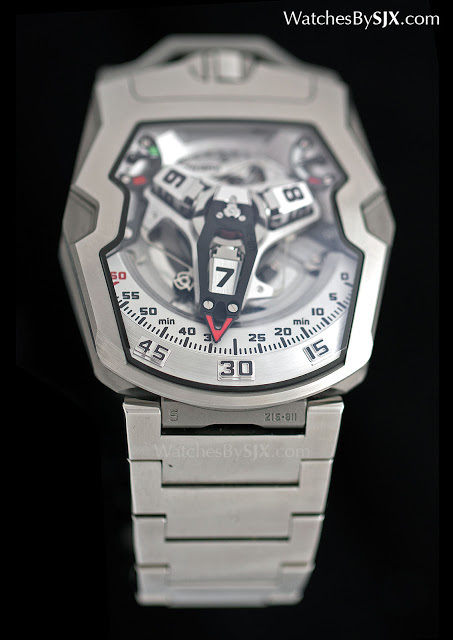 The rest of the watch is vintage Urwerk. The case is steel with a brushed finished, combined with a back made of black coated titanium. 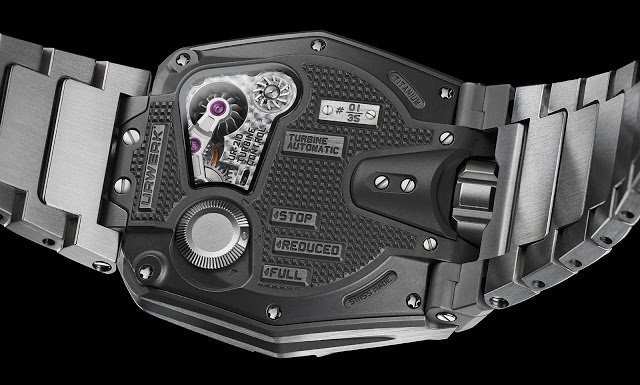 Urwerk’s patented turbine winding mechanism is visible on the back, along with a control that regulates the speed of the turbine. The regulator is intended to match the winding efficiency with the wearer’s physical activity. A lazy person would do well to set the turbine to “full”, while “reduced” or “stop” is best suited for sports. In keeping with the look found in several other steel Urwerk watches, the UR-210S Full Metal Jacket is primarily monochromatic, with the dial and satellite display in the same colour as the case (in stark contrast to the recently unveiled UR-105 in orange or yellow). 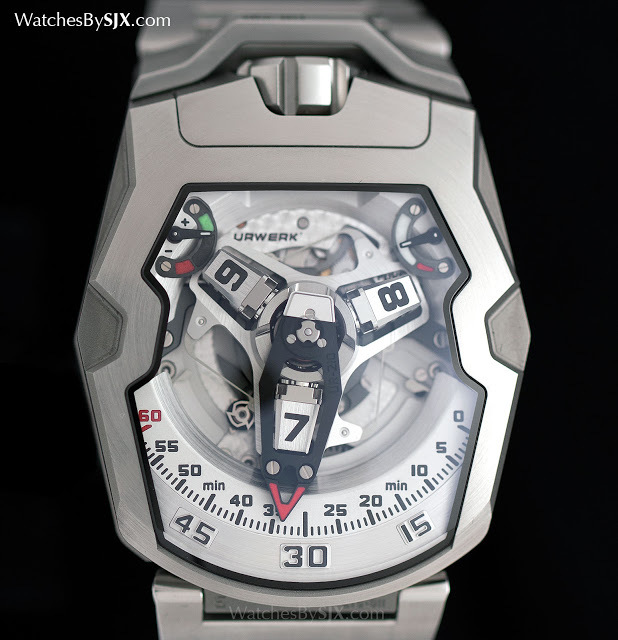 Limited to 35 pieces, the UR-210S Full Metal Jacket costs SFr145,000 before taxes.